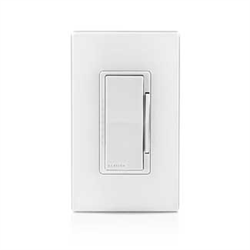 The Leviton Decora Smart WiFi in wall dimmer lets you automate, control and schedule dimmable lights with no automation hub required. Set-up is simple, wire it in and enroll the device in the free iOs or Android app. This device can be installed in new and retrofit applications and features true rocker action - tap the top for on, tap the bottom for off. Use the dimming bar on the side to adjust brightness level. Vanishing LED indicators show the current brightness. Leviton Decora Smart WiFi devices work with Alexa and Google Assistant so you can easily add voice control without having to add any hub. 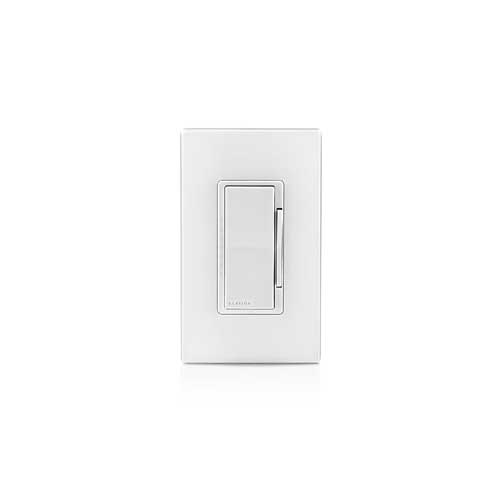 For example you can ask Alexa to turn on your table light or fountain..
For 3 way (2 switches) or multi-way appllications, add a DD00R-DLZ remote switch(es).